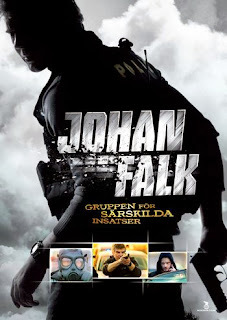 After the three movies about renegade cop Johan Falk, director/creator Anders Nilsson called it quits. The Third Wave was supposed to be the concluding installment in the series. But a few years later he found inspiration for a television series about his lone wolf protagonist from the swedish headlines; There was a scandal about a secret swedish crime fighting unit using illegal means of bringing down organized crime. One of those illegal means was using a civilian as an undercover informant. An informant that actually performed various illegal activities in order to protect his cover. This is probably nothing new in the States, but here in Sweden, organized crime is a relatively new threat and the legislation about handling them has been lagging behind the times. The moral ambiguity of it and the insight into howstressful it would be playing an informant is part of what is interesting and fresh about the tv-series and because of it the focus shifts from Falk to the undercover informant in question,Frank Wagner played by Joel (the new RoboCop)Kinneman. Johan Falk becomes his handler and the relationship between them is central to the arc of this suspenseful series. As this is the first entry in a new context for Falk, it introduces all of the characters relevant to the series. Falk comes back to Sweden after being stuck behind a desk at Europol in Brussels looking for some action. He is offered a job in a special unit against organized crime whose methods lies in the grey area of the law and one of them is handling civilian informants,something that is not even legal. Falk has his doubts about the methods involved throughout the series, which I think is good and also debunk a lot of the criticism that the series acts as a proponent for fascism. The series continues throughout to show how problematic such an approach would be and what effect they would have. As I have stated in previous Falk-reviews I think the more socially relevant issues might be more interesting to scandinavians but it might also be interesting for genre fans to see familiar genre conventions operate within a different national context. Don´t expect the spectacle of american actionfilms, but as with the other films in the series it relies heavily on realism, and the quality of the writing when it comes to the plot and character ,even though the dialogue is just as bad as previous efforts. There are currrently twelve feature-length episodes that cover this story-arc and there are six more in development that is probably going to shift its focus elsewhere storywise. What path Nilsson has decided to take with these is anyones guess, I know I am excited for more.